Best Depilatory Creams for Pubic Hair - Say NO to Chemical Burns! Is Hair Removal Cream Permanent? Does Hair Grow Back Darker After Nair? Does Hair Removal Cream Make Hair Grow Back Thicker? How To Remove Pubic Hair With Hair Removal Cream? What To Put On Your Skin After Depilatory Creams? How Do You Treat Hair Removal Cream Burns? 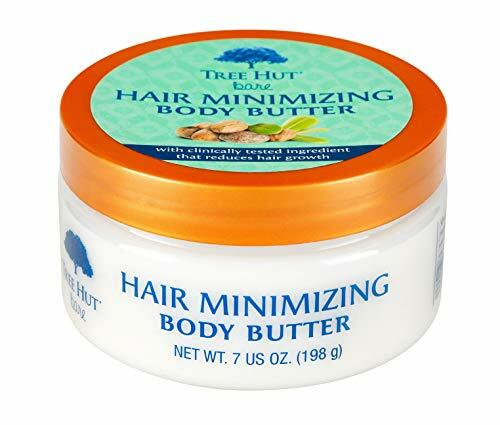 Is There A Cream That Stops Hair Growth? Does Stop Grow Hair Removal Cream Work? Want to skip the pain of waxing? How about the razor burns, nicks and cuts you get from shaving? Don’t worry girl, I have a good recommendation for you –> depilatory creams for pubic hair. Well, the truth is, regular depilatory creams can really cause irritation down there, even nasty chemical burns. That’s why it is important to choose only the best bikini hair removal creams specifically formulated for such a sensitive area. I used to be so afraid of using depilatories for pubic hair after hearing about my friend’s little Veet accident on her boyfriend’s privates (man-scaping). She used the regular variant that she uses for her legs and left it on a little longer than what was indicated, thinking it’ll need “more time to marinate” since the hair down there is coarser. After 15 minutes, she scraped it off with a spatula and along with all these melted hair and cream came a thin layer of her boyfriend’s skin. Ouch! Use specially formulated hair removal cream for women’s (men’s) privates and not just the regular variant of depilatory cream. Do a patch test to check for any sensitivities from the chemicals used in the cream. Follow the package instructions to a T.
Being definitely better compared to shaving, I got tempted in trying depilatory creams so I gave it a go. Keeping in mind these lessons that I learned from my friend, I scouted for good pubic hair removal creams and found a very close competition between the below 3 products. As with all depilatory creams, ALWAYS DO A PATCH TEST FIRST ON A SMALL SKIN AREA! Please don’t assume that a sensitive formula for a depilatory cream automatically means that you won’t have skin irritation or an allergic reaction. Looking for the best bikini hair removal cream? Liberex may exactly be what you’re looking for. This hair removal cream acts fast and is super effective. 6-8 minutes is all takes to get that smooth and hair free bikini line, minimizing the risk of getting chemical burns and irritation. Super gentle and rich in moisturizing skin agents like Aloe Vera and Sweet Almond oil, Liberex truly cares for your skin. Works fast (just 6-8 minutes). Effectively removes unwanted hair on the legs, arms, knees, underarms and bikini line. Dermatologist tested gentle enough even for sensitive areas. Contains Aloe Vera, Allantoin and Sweet Almond Oil that creates a barrier of moisturization that protects, soften and calms the skin. Slightly expensive than regular brands like Nair and Veet. Being a reputable brand in the world of hair removal, Veet’s sensitive formula is a good pubic hair removal cream for sensitive skin. It works in as fast as 5 minutes and contains Aloe Vera and Vitamin E that soothes and moisturizes your skin. The application is easy peasy thanks to the mess-free pump bottle and spatula that comes with the kit. 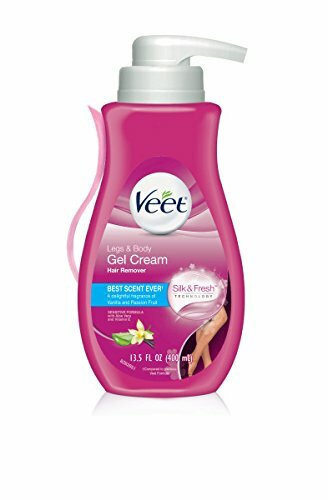 In my opinion, this is the best Veet for pubic hair and you’ll be bikini ready in a jiffy! Works fast (removes hair in 5 minutes). Dermatologist tested safe and gentle for sensitive skin. Contains Aloe Vera and Vitamin E to leave skin soft and moisturized. Comes in a pump bottle and with a free spatula for a mess-free application. The strength of the product is debatable – may leave patches of stubborn coarse hair (doesn’t get the whole thing off even after leaving it on for 5 minutes). Be beach ready in minutes without the razor burns, nicks or cuts. 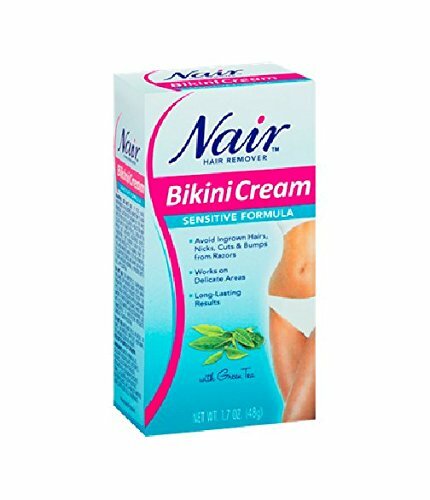 Nair Bikini Cream is safe and effective and works in as little as 6 minutes. Infused with Green Tea extracts and Sunflower Oil to soothe and moisturize your skin, you’re bound to get softer smoother skin with every use. Works fast (removes hair in 6-10 minutes). Doesn’t come with a spatula and requires to be applied by using the fingertips. The bottle is quite small and only packs 3-4 uses. Veet and Nair are two hair removal giants that have proven their place in this industry for years. While both products are fast and somehow effective, there are still patches of hair left that I can’t run over again with the cream if I don’t want to get burned, so I end up going over it with a razor instead. I find that Liberex contains more skin-friendly natural ingredients and no mineral oil that commonly cause irritation to some people. All this while being fast and super effective, it can get all hairs in one swipe. The price may be a bit more compared to Veet and Nair, but being mostly natural and effective, I don’t mind spending that much for such a good quality product that is guaranteed safe to use down there. 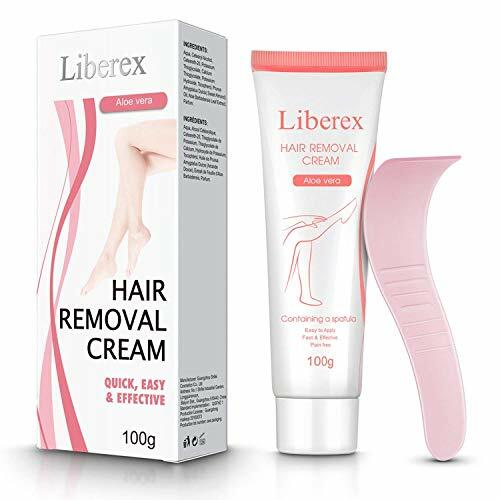 Liberex is now, definitely the best hair removal cream for pubic hair in my book. Now, that we’ve ruled out which is the best depilatory cream for coarse pubic hair, let’s move on to some pressing questions that most girls are dying to know when it comes to vaginal hair removal products. Hair removal creams are not a permanent solution to unwanted hair, their results last a little bit longer compared to shaving and a little bit shorter compared to waxing. If your goal is to get rid of hair permanently sans the pain, I suggest trying IPL. This method may take 6-8 treatments before you actually start to see dramatic results that last months (there will be new hair growing out of dormant follicles when triggered by hormones). If you want to be hair free for life and can take a little bit of pain, you may get electrolysis treatments from the salon or clinic near you. Interested in trying IPL? You may check out my previous article on this topic here. No. The creams don’t change the quality of hair at all. It gives the tips a more rounded or softer edge compared to shaving but the thickness is pretty much still the same. On clean skin apply some product using the provided spatula or your fingers. Leave on as per product instructions. Wipe off the product using the spatula or a moist towelette by going against the direction of hair growth. Wash off any excess with water, lots of water. Note: If there are remaining hairs left, do not go over it again with the cream. The cream melts and strips off dead skin cells, which in turn leaves your skin fresh and more sensitive to chemicals. Applying it over the same area within 24 hours can cause irritation and chemical burns. Simply shave leftover hairs if needed. Since depilatory creams can strip off skin moisture, it is best to follow up with a good moisturizer to calm and nourish the skin. Made from 100% natural Shea Butter and paraben free, this moisturizer works double duty by inhibiting hair growth while leaving skin moisturized. You’ll notice a longer gap between your hair removal treatments as you use it daily. Prone to getting ingrown bumps and irritation? I suggest getting the famous Tend Skin. It has active ingredients that slough off dead skin cells to release trapped hair. Just be careful in your application, this product is alcohol based and is meant to be applied externally only. Having chemical burns from depilatory cream is no different from other kinds of burns. If and once you feel a burning sensation right after applying the cream, remove it immediately by washing off with cold water ensuring that no residue is left. After cleaning the area, the following tips can also help alleviate the discomfort caused by chemical burns. This helps calm the redness. A good one is CeraVe Hydrocortisone Cream. The bikini area is always in close contact with our undies, and just like getting a pad rash, constant friction can worsen the pain and irritation. Moisturize the area with petroleum-based products for an added layer of protection. The best one for this? 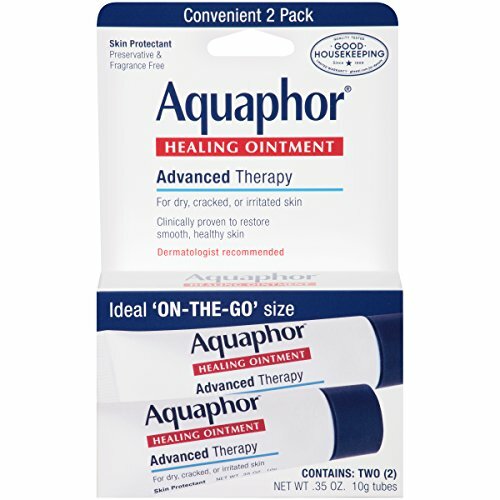 The good ol’ Aquaphor. If the pain feels like 7 hells, then it’s time to get some help from our dear friend, Ibuprofen. Choose something made out of cotton and not so tight fitting. Save your lacies for better days. If your burn started showing signs of infection (like having pus, a yellow substance oozing out of the area, fever, tenderness, and immense swelling), please don’t hesitate to see your doctor! Yes, there are creams, lotions and sprays available in the market that inhibits hair growth. It’s important to note though that on its own, these hair growth inhibiting products DO NOT remove unwanted hair and is supposed to be used as a supplement to your hair removal method of choice. Stop Grow Hair Growth Inhibitor Cream is not a hair removal cream, instead, it helps reduce the frequency of hair removal by penetrating the hair follicle and reducing its germinating phase during the Anagen stage (hair growth). It’s clinically proven safe and effective to use even on the most sensitive skin. As always, do a patch test before using a new product. It’s non-greasy yet moisturizes the skin deeply with Argan oil while halting hair growth. Containing mostly natural ingredients like Papain (from the Papaya fruit) and other natural enzymes, this lotion is surely safe even for the most sensitive skin. It’s a great compliment to your depilatory cream routine. Depilatory creams are definitely the most painless method of hair removal. It’s a popular choice among women with low pain tolerance and those who want quick and easy hair removal sans the irritation. While using regular hair removal creams may result to chemical burns and redness, choosing the right depilatory creams for pubic hair can help turn this negative experience around and give you bikini ready, smooth and hair-free skin without any irritation. I hope this article shed light on the question of whether or not you can use hair removal creams on such a sensitive area of your body. As always, if you have pressing questions, comments or suggestions, you may write anonymously and I’d be more than happy to answer them for you. Ciao! Want to explore other options in removing unwanted hair on your bikini area? Check this article to get more information on other bikini hair removal methods!